The Sofia City Prosecutor's Office final count of the alleged illegal ballots discovered at a printing house in Kostinbrod hours ahead of the May 12 early elections is 480 000. The final number was announced at a special briefing Friday by the monitoring prosecutors from the Sofia City Prosecutor's Office, Roman Vasilev, Vanya Stefanova, and Stoil Toychev. The probe further established that the packaged and addressed ballots were to be shipped to all electoral regions in the country, and to voting polls abroad, but for some regions, such as Kardzhali and Blagoevgrad, the number set aside has been higher, compared to others. None of the ballots had been filled in advance or had any marks; 170 000 had been torn and cut. More information will be available after all expert reports conclude, but it emerged from the briefing that finding the truth in the pre-election saga will be a very hard task. In addition, experts are expected to take months to establish the share of "technical spoilage" and the share of ballots that might have been prepared to manipulate the May 12 vote, according to reports of the Bulgarian National Television (BNT). The prosecuting authority has launched two investigations into the matter, one involving abuses accompanying the election process and the other one concerns malfeasance in office by the administration of the government. Over 30 people from the administration of the Council of Ministers and the Kostinbrod-based printing house have already testified. 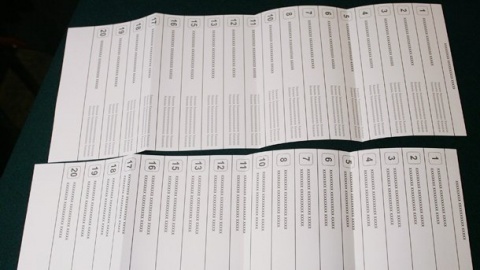 Late on May 10, a team of prosecutors and officers of Bulgaria's State Agency for National Security (DANS) stormed into a printing facility in the western town of Kostinbrod and seized a large load of ballots. It was reported that the Multiprint company had been awarded a public procurement contract worth around BGN 800 000 to print and deliver 7.8 million ballots for the May 12 early elections. The firm had been under an obligation to print and deliver the ballots to the district administrations by May 8. The printing house is owned by a municipal councilor in Kostinbrod from the formerly-ruling center-right Citizens for European Development of Bulgaria party, GERB, which prompted opposition parties to accuse GERB of an attempted voting fraud. The owner claimed that the extra ballots had been technical spoilage. GERB leader and former Prime Minister, Boyko Borisov, insists his party's chances had been damaged by allegations. Bulgarians went to the polls on May 12 to elect a new Parliament after the GERB government led by Borisov resigned on February 20 amid nationwide anti-poverty and corruption protests. The election campaign was accompanied by another serious scandal involving alleged unauthorized use of special surveillance devices during Tsvetan Tsvetanov's term in office as Interior Minister.